I was so excited to attend the blogger event hosted by The W Nail Bar. The owner's, Manda and Lauren were the best hostesses and made me feel like a princess! When I walked in, they showed me around their GORGEOUS salon and then offered me a mimosa (my favorite). I mingled with the other local bloggers then we got started on our complimentary manicures and pedicures. 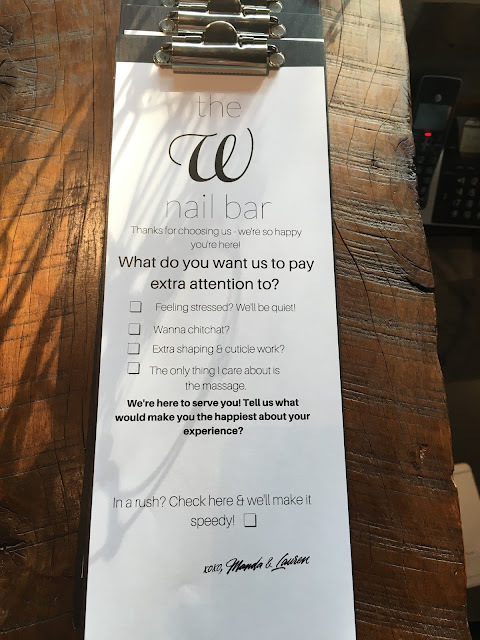 The W Nail Bar is a 100% all natural nail bar. They only use green, sustainable and locally sourced products. When you go there to get a pedicure, you get to pick what your feet are soaked in (choices ranging from: buttermilk, peppermint, coffee, rose petals, etc). I chose peppermint because it was for relaxation and it smelled amazing! I think this is such a cool idea and they make them fresh everyday. We were all snacking on delicious chocolates while getting to know each other, it was the best Sunday Funday ever lol. I chose a light pink for my nails and a hot pink for my toes and I loved them both! Manda and Lauren are the true definition of #girlbosses. They are planning on opening up two more locations this year! And one is by me, yay! To check out more about this amazing salon, you can visit their website here. I absolutely LOVE EVERYTHING about this Nail Bar!!!! So in LOVE with the decor!!! I want to make an appointment and experience the beauty of it all! Super cool and beautiful!!! Sounds like such a dream! !